Seakeeper, Inc., the leader in marine stabilization, announced the launch of the Seakeeper 2 at the Miami International Boat Show. The newest and smallest Seakeeper yet is designed to eliminate up to 95 percent of boat roll on 27- to 32-foot vessels. The Seakeeper 2 is 25 percent lighter (414 pounds) and 22 percent smaller (24.8” L x 25.5” W x 20” H) than the next smallest model. 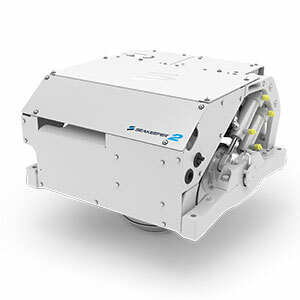 The Seakeeper 2 will run exclusively on 12-volt DC power and cost $22,700. The unit’s small size allows it to be installed virtually anywhere, with many consumers opting for a leaning post replacement which can be done with no major structural modifications. The unit will utilize the newly designed touch screen control panel with an intuitive user interface and allow users to capture real-time performance information. Orders are currently being accepted, and shipments will start in April 2018. A recent expansion of the Mohnton, Pennsylvania factory will aide in meeting the increased demand expected following the launch of the Seakeeper 2.